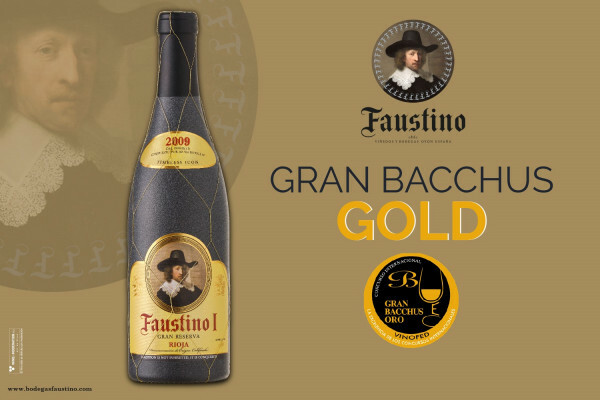 Faustino I, the Gran Reserva 2009 wine made at Bodegas Faustino in the Alava region of La Rioja, was awarded the highest recognition at the 2019 Bacchus Awards. Just 23 out of 1650 wines were honoured with the “Grand Bacchus Gold” award, in the event organised by the Spanish Union of Wine Tasters (UEC) and recognised by the International Wine Organisation (OIV). Of these wines, only 15 were Spanish labels, and just three were produced under the Rioja Appellation of Origin. Four wines produced in Jerez also gained this award, two from Ribera del Duero and one each from Toro, Rueda, Montilla Moriles, Rias Baixas, Valencia and Ribera de Gállego. An experienced panel of experts comprising a joint committee of 90 professionals and wine-tasters, including 6 Masters of Wine, spent four days rating the best wines served by qualified sommeliers, always from perfectly concealed bottles that could only be identified through a code. The judges assessed the wines, scoring them from 0 to 100 after a visual, olfactory and flavour tasting session. Out of the 1650 wines, only 23 scored between 92 and 100 points necessary to be awarded the Grand Bacchus Gold. Of these 23 wines, eight were from outside Spain and fifteen were produced on national territory. After the scoring, the data sheets, including relevant technical aspects by the individual judges, were entered in software in order to obtain the final medal ranking. In addition to the aforementioned Grand Bacchus Gold for Faustino I 2009, the Group was also awarded two additional Golds for the Winery’s youngest wine from Laguardia, namely “Campillo El Niño, 2017” and another for its rosé wine produced in Castilla La Mancha, “Condesa de Leganza” Family Selection. Finally, Bodegas Faustino was also honoured with a Bacchus Silver for its Faustino Brut Reserva Cava. An iconic wine produced at the Rioja winery, with the 2009 harvest being marked by ideal weather conditions for harvesting different varieties of grapes at the optimum moment of ripening. Made from a selection of Tempranillo, Graciano and Mazuelo grape varieties conferring this wine an elegant structure and acidity, it has an intense, complex nose with a sweetness reminiscent of a blend of ripe fruit, a hint of vanilla, jam and cinnamon, among others.